Behind the Wheel in the Rain: Even at slow speeds, a car crash may occur when driving along slippery or flooded Miami streets; basically because car brakes do not respond as effectively when wet and drivers may fail to detect bad road conditions such as potholes, obstacles, or curbs, all of which can cause motorists to lose control of their car and lead to personal injury. Furthermore, the increase in cell phone use while driving amid foggy windshields and rainy roads is leading to more and more car accidents. Given our professional experience representing clients that crash their car or are crashed into on Miami highways and streets, we encourage motorists and passengers to contact a Personal Injury Lawyer immediately after the police file their report and any injuries that require immediate attention are attended to. Many times, regardless of whether or not there are evident signs of personal injury, there may be consequential injuries that may take time to reveal themselves. Some of these injuries may include Brain or Spinal Cord Injuries as a result of sudden impact to the head or whiplash. Driving a car, SUV, or truck carelessly or at high speeds usually leads to a car accident that may result in serious personal injury, property damage, or loss. The probability of a car accident under the above mentioned circumstances increases when driving along a rainy highway or down a flooded Miami street. 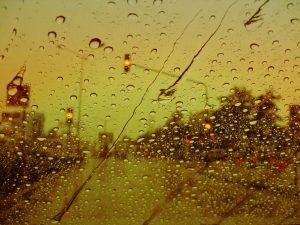 When it rains, not only do Miami roadways and streets become slippery, but visibility also becomes a factor which can result in a car accident. If you have crashed in the rain or were crashed into by another vehicle, either as a motorcyclist, cyclists, skateboarder, or pedestrian, the Perazzo Law Car Accident Attorneys urge you contact to us to discuss your legal rights to compensation for your personal injuries, damages, or losses. We also urge car accident victims to Contact us ONLINE or Call (786) LAWS-411 for a FREE initial consultation to understand where victims stand with regards to PIP and insurance litigation. THE PERAZZO LAW FIRM: DEDICATED TO PUTTING YOUR INTERESTS FIRST!